I've always loved St. Patrick's Day. No, it's not just an excuse to celebrate, drink green beer or wear funny hats. And for me it has nothing to do with Patrick, saint or not. It's that St. Patrick's Day is not only a celebration of specific nationality and heritage, it's an inclusive celebration. It embraces everybody. As the saying goes, everybody is Irish on St. Patrick's Day. As a kid, with no real roots in any culture or traditions, I felt embraced by this, and I took it to heart. For this one day, me and the rest of the world were all Irish, and we celebrated together. For that reason, this day still holds a special place in my heart. Hmmm, my only problem is the cake pans. I may have to get creative with large cupcake tins. I'll add photos later. In a small saucepan, combine milk and chocolate and stir over low heat until chocolate is melted. Add sugar. Pour over espresso. Add Irish Whiskey and Bailey's. Top with whipped cream. In a word... YUM. Alternatively, you could just heat the milk and add 2 tbsp powdered cocoa, or Nestle's cocoa, if you really want to make it easy. And last, but not least, some recipes for making your own Irish Creme Liqueur. I don't know if these recipes are true to the Bailey's I love, I'll have to try them and see, because they use both chocolate and coffee! Who knew? That may explain why I like Bailey's so much, eh? Heheh. I LOVE St. Patrick's Day too; because it is my wedding anneversary. My husband Willie & I were married in 1984. We will be celebrating 24 years together in 2008. We have 2 living children and 4 in heaven! The choco-fest was wonderful, and a good time was had by all. :)) And to top off the wunnerful weekend, we had rain! Miraculous, drenching, fantabulous RAIN. The streets are still wet. I can feel the grass getting green already. How wuz the chocolate fest?..lolz and happy anniversary girly! 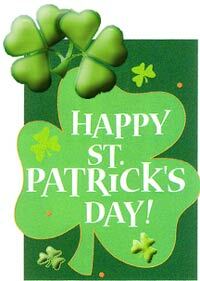 Happy St. Paddy's day to all. Could we break our lenten fast today? Let's go celebrate with chocolate cake and mocha Yummmm! !